Our August 2016 edition consists of two writing workshops over 3 session dates that will explore and give voice to personal and societal issues from the perspectives of women and men. Online Office Hours included on Wednesdays from 8pm – 9pm. Applicants must provide samples of their work. Accepted members are chosen by the La Sopa directors, entrance into the program requires a membership fee of $75 which provides access to all offline and offline material during the length of the Summer Session II series. Deposit due Friday August 12th. Please send 3 samples of your work & Submit your application here! Saturday Aug. 13th, 11 am – 1 pm. Saturday 20th, 11 am – 1 pm. Saturday Aug. 27th 11 am – 1 pm. society, and to cultivate empathy as a writing practice. with sisters who know that your voice is a necessary companion to her own. write with sisters who know that your voice is a necessary companion to her own. 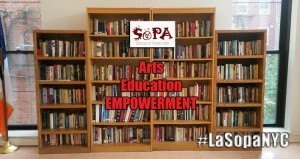 La Sopa is facilitated by established members of the arts community who are seasoned teaching artists. The founders, as poets began the series with poetry workshops, and have plans to expand the series to include many more artistic disciplines. With their finger on the pulse of the arts movement throughout the tri-state area, they have access to professors and teaching artists who are knowledgeable in many different arenas. Their pedagogy is that of a Community S.T.E.A.M. program with a special focus on Science, Technology, Engineering, Art, and Mathematics, as it pertains to adult innovators seeking mastery of arts or entrepreneurship. T echnology: The use of cutting edge phone/computer apps and tools for writers and artists along with best practices in use of Social Media engagement. E ngineering: Sound and Stage Engineering for Theatrical classes and/or Music Production as well as App creation. A rts: Prose and Poetry Writing, Performance, Acting, Screenplay, Vocal, Live Paint, Comic Book/Graphic Novel art, Web Design. M athematics: Financial Education Classes with a focus on ground level issues such as credit, saving for retirement, and real estate for first home/condo/co-op. The School of Poetic Arts (La SoPA NYC) is an educational workshop series from Capicu Culture that provides a communal space dedicated to the development of artistic skill and exploring the core principles of theatrical and literary expression. Join us as the first official summer of our Artist residency at The Loisaida Center, Inc! As artists and scholars from historically marginalized communities, we feel that it is important to create opportunities for our stories to be seen, read, and heard. 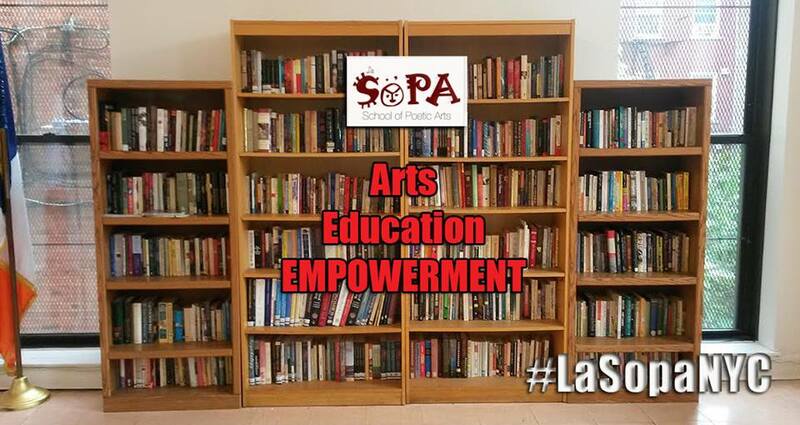 La Sopa provides a platform for those voices to be supported and uplifted, increasing the proliferation of creative works across the artistic spectrum. Our time together, generating and editing works, launching new ideas and projects, is an inspirational way to end each week and begin anew. We look forward to the return of our previous participants, as well as the addition of new voices that will enrich the experience.